London has long been one of the world's great iconic cities. It is a place of deep contrasts, where the traditions of centuries sit side by side with all of the excitement and advancement that the modern world has to offer. It's a tricky line to walk when creating something new, which is why the right architect or designer can make all the difference. And when one person can be both, it's a very good sign that something exceptional is about to happen. Travis Walton has been in the business of creating exceptional things since 2010. 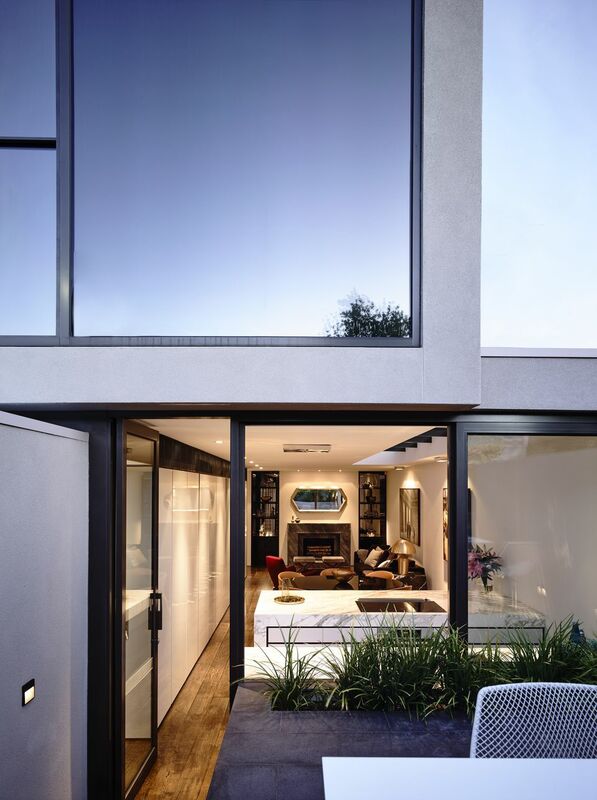 With a practice that spans Melbourne and Sydney, Australia as well as London, the 33 year old architect and designer already has an impressive resume behind him. But when an old London home needed a Manhattan-inspired makeover that would still keep it's English charm, it was a challenge that Walton couldn't pass up. The goal for the client, who travels extensively for work, was to be able to return home to a space that would rival any of the 5-star hotels that he would stay at while on the go. More specifically, they asked for something "slick and modern with a touch of Tom Ford." Walton delivers with an open plan living and dining room that is amazing from floor to ceiling. The Solid Timber European Oak floors, provided by Tait Timbers, are burnished with a dark stain, providing a moody backdrop for the rest of the room. Contrasting this, a bright red Minotti Denny Chair offers a beautiful pop of color that brings life and energy to the room. As the main space in the home, the living room is a delightful mix of modern elements. A stylish leather sofa from B&B Italia continues to set a moody tone while a bold, Atollo table lamp adds a bright metallic pop that draws the eye and echoes the brass coffee table. To help keep the entire room in focus, pattern comes from the floor in the form of a dark, navy-blue rug with a striking white geometric pattern. Putting the perfect finishing note on this vignette, a large modern painting over the sofa fits perfectly into the neutral wall color while still providing a final hint of red. On the far end of the living room, the traditional English fireplace takes another modern turn. Designed to the client's precise specifications, the mantle and hearth are made from 20mm thick Bardiglo Italian Marble. Meanwhile the shelves flanking the fireplace are tastefully appointed with glassware and other accessories. In the study, more traditional elements of English decor come to the fore, albeit still with a masterful eye toward the contemporary. The French bureau plat writing desk that dominates the room with it's classical aesthetic and burnished wood and metal tones is accompanied by a custom Louis black leather desk chair all set against the modern Greek key rug in electric shades of blue. Presided over by an antique-style light fixture which complements the desk beautifully, this room is the perfect marriage of traditional and contemporary influences, blended seamlessly into one amazing room. Even the structural layout of the home was altered to give the look and feel of a world-class hotel. Here a bridge-style hallway connects two rooms on the upper floor. Adding to the bespoke atmosphere of this home, a fully integrated Bose system extends from the bedrooms through the hallways and into the kitchen and bathrooms. Providing round the clock background music, the system provides a level of ambience on par with the world’s leading hotels and unique to this home. In the bedroom, Walton designed and constructed both the headboard and side tables. The neutral color palette is highlighted by colorful bed pillows and an array of black and white photos hanging overhead. The bathroom is a study in patterned materials. A marble backsplash and dark zebrawood vanity create layers of color and pattern while the slate floor and shower wall mirror and complete the black-and-white color palette of the marble. The combination of materials creates layers of natural pattern for a visually enticing yet highly functional powder room.